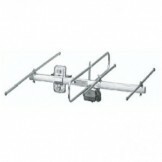 Yagi antenna of 3 elements designed to receive digital signals redio (DAB). Built in aluminum plated antioxidant protection. Robust antenna with high resistance to the elements. With junction box made of polystyrene with anti-ultraviolet radiation treatment.